A few months ago, Croatia-based sensor technology company Geolux successfully completed the installation of a cutting-edge hydrology monitoring station over the river Sava in the country’s capital city, Zagreb. The innovative station consists of five surface velocity detectors and one contactless water level meter. Three out of five surface velocity sensors are placed above the riverbed, while the additional two surface velocity sensors are placed above the flooding area surrounding the river. 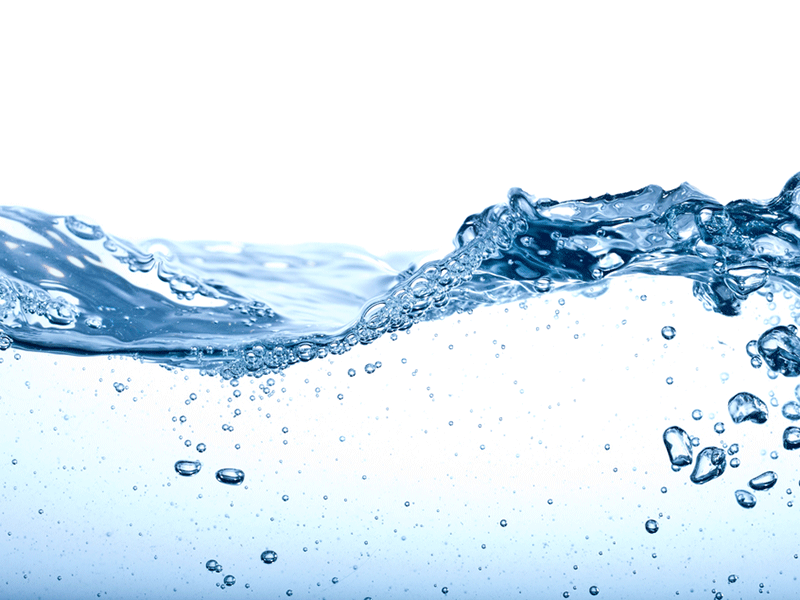 Total water discharge is calculated based on the combined measurements from surface velocity sensors and the water level sensor. 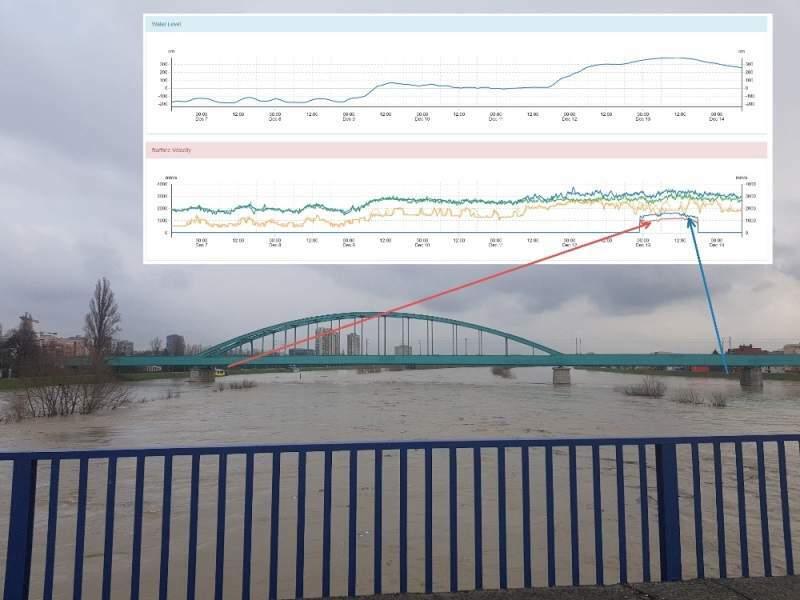 This week, due to rainfall, the level of Sava river rose higher than riverbed and spread across flooding area. Surface velocity sensors placed above the flooding area started detecting the flow of water over flooding area, which is much slower than the flow in the central channel. Thanks to multiple surface velocity sensors, the system was able to accurately measure increased water flow. The measurement accuracy of the system was evaluated independently using multiple type ADCP instruments. 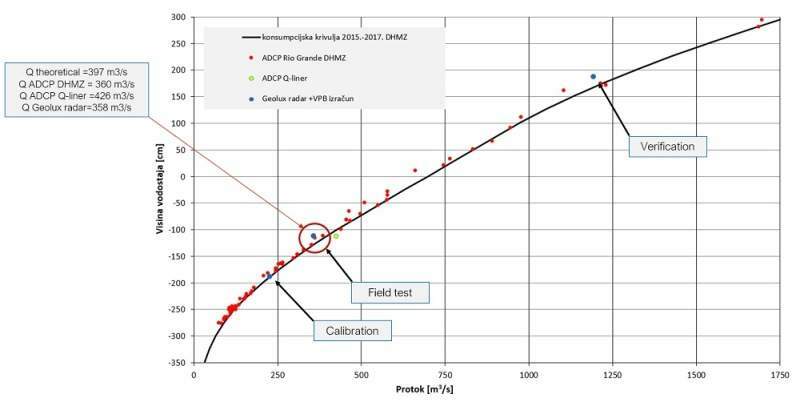 The tests showed perfect matching in water discharge between ADCP measurement and the measurement based on non-contact surface velocity and level meters. The Q/H graph shows recent ADCP measurements as red dots, with blue dots representing measurements from non-contact instruments. The black line on the graph is historical Q/H line, which is somewhat below the newer ADCP measurements, due to changes in the river channel. For more information and real-time measurement monitoring, please contact Geolux via the enquiries form.